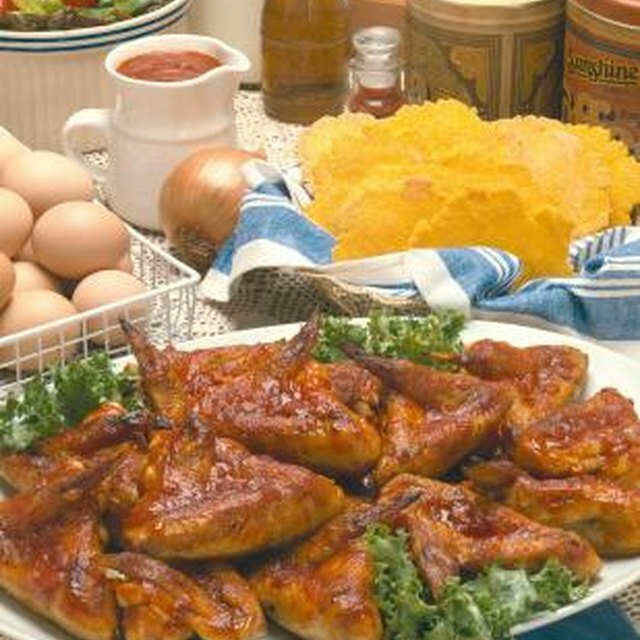 Baking soda can help make chicken wings crisp and golden. 3 Should You Bake Barbecue Ribs Uncovered or Covered? Although baking soda is primarily used as a leavener in baking, it has a number of other uses. Its ability to absorb moisture and odors in the refrigerator is well known, and even a pinch of baking soda can improve the browning and color of baked goods. Although few cooks are aware of it, baking soda can also help improve the browning and texture of meats such as chicken wings. 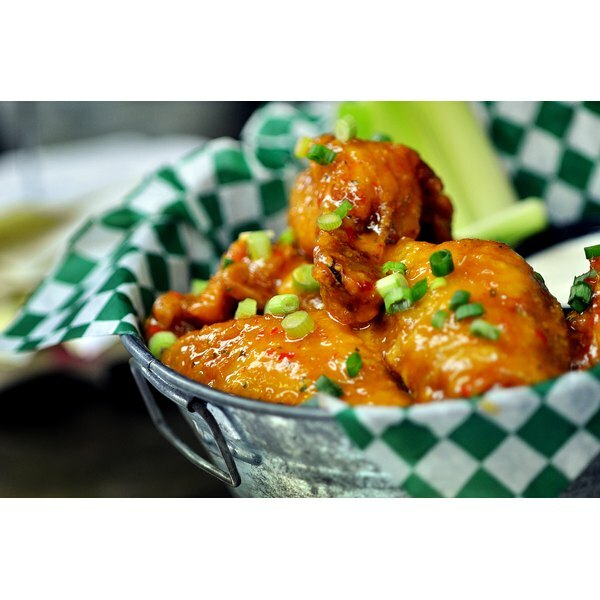 There are dozens of ways to flavor grilled chicken wings, but the cooked wing should meet a few basic requirements. It should have a crisp, golden skin, well puckered and blistered from the heat. This helps sauces adhere to the cooked wing. Much of the fat should render out, leaving just enough to keep the flesh moist. Finally, the wing should be fully cooked but not overcooked. Grilling temperature is a large factor in achieving these goals, but baking soda can also help. Pour enough baking soda and salt to cover your wings into a plastic bag. You may want to use the ratio of 1 tablespoon of salt to 1/2-cup of baking soda. Separate the wings into flats and drumettes if necessary, and pat them dry with a clean paper towel. Drop the wings into the bag and shake it to dust them evenly. Line a large plate with a clean paper towel and spread the wings over it in a single layer, shaking off any excess. Leave the wings uncovered in the fridge overnight. The combined effect of the soda, salt and dry refrigerator air will remove excess moisture from the wings, allowing them to crisp on the grill. Prepare your grill with charcoal and light it. Oil the grate lightly to help minimize sticking. Once the coals have heated and settled down under a coat of gray ash, move them to the front and back of your grill. The wings will cook in the middle, at moderately high but indirect heat. This prevents flare ups and scorching from the dripping fat. Wipe your wings with a damp paper towel to remove any excess baking soda and salt. Season the wings with a dry rub, if you wish, then place them on the grill. Space them evenly, so the heat from the coals can brown all sides of the wings. The baking soda can leave a slight chemical aftertaste, so brush the wings very lightly with an acidic marinade. This produces carbon dioxide, which creates bubbles in the skin of the wings and helps make them crisp. Grill the wings, turning them periodically, until their juices run clear. They will be crisp and darkly golden, and should hold their texture for several minutes after sauce is added. What Is Circulon Made of?